​​Another tweet from iCahn to tell us he bought more this week. Any Bullet left Mr iCahn? Bet the House on that one ? For the bullish scenario to continue, I need that we stay above $547.80. ​consolidation / range trade for a few session. ​​​Apple shares outperformed the SP500 on Jan 23 ​(2nd chart below). Expect a day trading range between $546 to ​​$557 with average volatility. ​​​I took 11 trades on $AAPL on Jan 23: ​Total Trading Daily Profit $6.90/sh. Jan 23 iCahn't Get No Satisfaction ? ​Another tweet from iCahn to tell us he bought more last week. Already embedded into the price action. Tell me something I don t know! ​​​Apple shares outperformed the SP500 on Jan 22 ​(2nd chart below). ​​​I took 15 trades on $AAPL on Jan 22: ​Total Trading Daily Profit $11.40/sh. ​​​​Jan 22 The Price Action Teaser ? bounce on Jan 21: for me, it remains only a Price Action Teaser. For the bullish scenario to continue, I need that we stay above $546.90. ​​​Apple shares outperformed the SP500 on Jan 21 ​(2nd chart below). Expect a day trading range between $543 to ​​$553 with average volatility. ​​​​​Jan 21 The Perfect CHL Storm ? ​Those events were all we needed to create the The Perfect CHL Storm ! Expect a day trading range between $539 to ​​$549 with extreme volatility. ​​​I took 8 trades on $AAPL on Jan 17 ​Total Trading Daily Profit $7.20/sh, Total Weekly Profits of $38.80/sh. ​​​Jan 17 Consolidation Phase Still ? ​$565.30 max $568.30 for now. ​Apple shares underperformed the SP500 on Jan 16 ​(2nd chart below). Expect a day trading range between $546 to ​​$556 with average volatility. ​​​I took 4 trades on $AAPL on Jan 16 ​Total Trading Daily Profit $4.60/sh. ​​​​Jan 16 Consolidation Phase ? ​and retest the $551 zone and rebound from it towards $561.90. ​Apple shares outperformed again the SP500 on Jan 15 ​(2nd chart below). Expect a day trading range between $550 to ​​$561 with average volatility. ​​​​Jan 15 CHL Double Deal ? ​Apple shares outperformed again the SP500 on Jan 14 ​(2nd chart below). Expect a day trading range between $548 to ​​$561 with extreme volatility. ​​​​Jan 14 Hit and Run? ​$533.30​​ first max $528.20. And we did it on Jan 9 and 10. ​now $528.70 as ​support and $541.10 as resistance. ​Apple shares outperformed again the SP500 on Jan 13 ​(2nd chart below). Expect a day trading range between $532 to ​​$543 with above volatility. ​​​​​Jan 13 The Apple Abysmal Experiment ? ​$533.30​​ first max $528.20. And we did it on Jan 9. ​now $531.90 as ​support and $543.60 as resistance. ​Apple shares underperformed again the SP500 on Jan 10 ​(2nd chart below). Expect a day trading range between $528 to ​​$538 with average volatility. 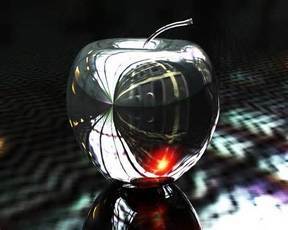 ​​​​Jan10 Rotten Apple Capitulation Phase ? ​now $533.30 as ​support and $545.20 as resistance. ​Apple shares underperformed the SP500 on Jan 9 ​(2nd chart below). Expect a day trading range between $533 to ​​$545 with average volatility. ​​​I took 19 trades on $AAPL on Jan 9 Total Trading Daily Profit $3​.90/sh. ​now $535.80 as ​support and $548.50 as resistance. ​Apple shares outperformed the SP500 on Jan 8 ​(2nd chart below). Expect a day trading range between $538 to ​​$549 with average volatility. ​​​I took 7 trades on $AAPL on Jan 7 Total Trading Daily Profit $7​.20/sh. ​​​Jan8 The Sum of All Fears ? 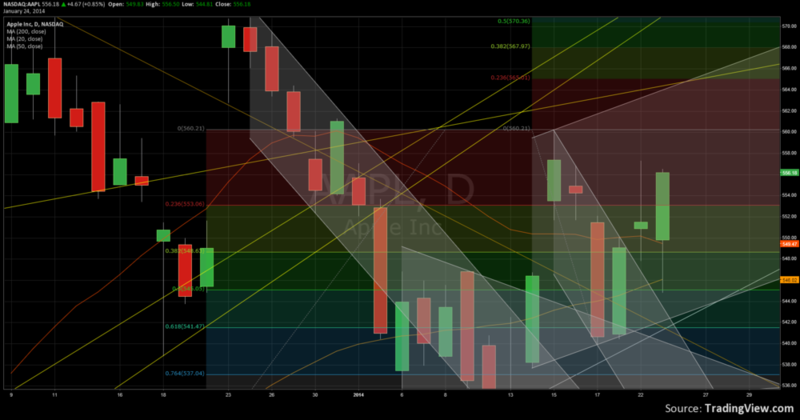 $526.10 as support and $542.30 as resistance. ​now $537.60 as ​support and $550.70 as resistance. ​Apple shares underperformed the SP500 on Jan 7 ​(2nd chart below). Expect a day trading range between $535 to ​​$547 with average volatility. ​​​Jan 7 Is Good Enough ? $529.60 as support and $546.00 as resistance. ​now $540.80 as ​support and $553.10 as resistance. ​towards a retest of $538.80 for now. 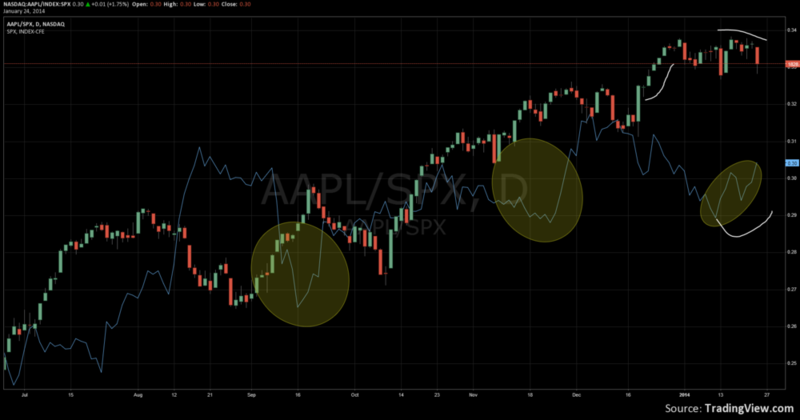 ​Apple shares outperformed the SP500 on Jan 6 ​(2nd chart below). Expect a day trading range between $539 to ​​$552 with average volatility. ​​​​JAN6 The China Syndrome ? ​Since Dec 31, Price Action was driven by portfolio rebalancing, end of the year. ​China Syndrome where too much optimism and the street caught too long..
​now $543.40 as ​support and $555.10 as resistance. Expect a day trading range between $536 to ​​$547 with average volatility. ​​​JAN3 Saloon s Door Experiment ? ​$545.10 as ​support and $557.70 as resistance. ​on March 2009 .​​( See charts below, amber trend line ). Apple shares underperformed slightly the SP500 on Jan 2 (2nd chart below). Expect a day trading range between $553 to ​​$561 with average volatility. ​​​​JAN 2 Apple Shares at Crossroads ? ​​On Dec 31, Price Action was driven by portfolio rebalancing, end of the year. ​$547.50 as ​support and $560.20 as resistance. ​cards... , ​unless $558.40 broken, a slippage towards $557.50 max $553.30. Apple shares outperformed slightly the SP500 on Dec 31 (3rd chart below). Expect a day trading range between $558 to ​​$564 with average volatility.